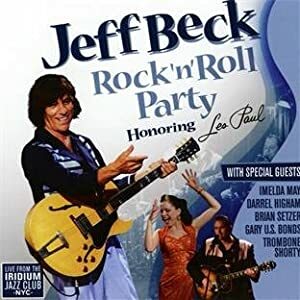 Jeff Beck rocks. We all presumed that to be self-evident but now it’s palpably true. He rolls as well – although that may be more to do with the passing of years. This album is a celebration of the life, career and music of Les Paul. It’s incredible to think that the man who built and put his own name to one of the iconic guitars of rock music lived until 2009. Even more so that, right up until his death, he played live every Monday at the Iridium jazz club on Times Square, New York. Jeff Beck was one of the iconic 60s virtuosos of the 6-string who, along with fellow Yardbird Jimmy Page, played Les Paul guitars. So it’s perhaps fitting that he was chosen to anchor this project – a live “celebration of Les Paul” – recorded in June 2010 at that very same Times Square nightclub, on what would have been Les Paul’s 95thbirthday. It is indeed a bona fide rock & roll jamboree – proper winkle pickers and bobby socks fare. Swing belters like ‘Crusin’ and ‘Bye Bye Blues’ bump backsides with gentler cuts such as ‘Cry Me A River’ and ‘I’m A Fool To Care’, along with rock & roll standards like the theme from ‘Peter Gunn’ and ‘Twenty Flight Rock’. The crowd applause between tracks only makes you wish you were there. Beck’s guitar work is precise, evocative, mellifluous. I’m a Beck fan, and always felt he had more to him than that other ex-Yardbird, Eric Clapton. As I come from a later generation I’ll always feel his best work was on the jazz funk albums of the mid 70s, but I appreciate where he’s coming from on this album, especially as he grew up on a diet of rock & roll. As a particular retrospective celebration, this is something quite different from other Beck albums, yet still his playing stands out, especially on instrumentals like “Sleep Walk”.